Dr. Harry Pennington, Dr. Wendy Pennington and the entire veterinary team at Pennington Animal Hospital understand the decision to allow your dog or cat to undergo surgery is never easy. For your pet's safety and your peace of mind, we follow the strictest surgical guidelines, including a proactive pain management regimen to keep your pet as comfortable and stress-free as possible. Perhaps the most important pre-surgical step is to discuss why we believe a particular procedure is necessary and what it entails. 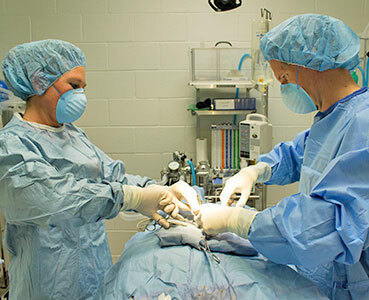 If your pet requires surgery, he or she will receive a pre-surgical physical exam, during which Dr. Harry Pennington or Dr. Wendy Pennington is available to answer any questions you may have. We want you feel comfortable knowing you are making the right choice for your pet. Whether your pet is in for a routine spay or neuter or requires a more complicated surgical procedure, you can have confidence Dr. Harry Pennington, Dr. Wendy Pennington and the medical team at Pennington Animal Hospital will work hard to ensure each procedure is performed according to the highest surgical standards and is as stress-free as possible for you and your pet. Should your pet require a surgical procedure that we do not perform, we will refer you to a highly skilled and trusted veterinary surgeon. Ensuring the health and safety of your pet during surgery is our utmost concern and requires a strict anesthetic and monitoring regimen. 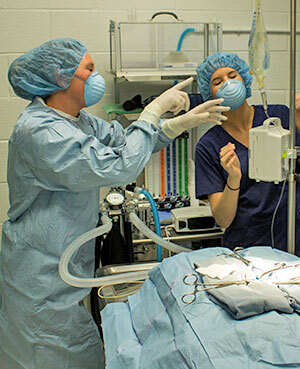 We utilize a multi-parameter monitoring and anesthesia system to ensure your pet's safety during all surgeries. Prior to surgery, your pet is examined and a pre-surgical blood screen is performed. The results of these tests, along with your pet's weight, age, breed, preexisting conditions and past anesthetic history, are used to create an individualized anesthesia protocol. During surgery, your pet is cared for by a highly skilled and experienced veterinary technician using our monitoring system which tracks blood pressure, heart rate, respiratory rate, body temperature and oxygen level. We all know pain hurts, but pain also has many other detrimental effects on your pet's body. Pain slows healing, decreases activity and causes behavioral changes such as aggression, anxiety and depression. Pain can also worsen diseases like arthritis. It also interferes with the bond between you and your pet. As part of our commitment to keep your pet comfortable and protect the bond you both share, we practice a comprehensive, multimodal pain management protocol. 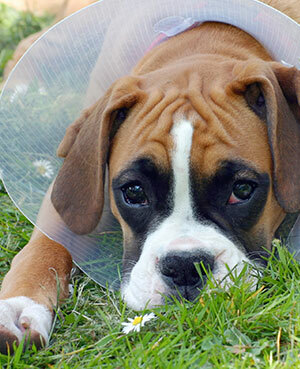 All pets undergoing surgery receive pain medication before, during and after the procedure. For acute and chronic conditions we use all our available and safe resources, including NSAIDs (non-steroidal medications) and narcotic analgesics for the complete comfort of your pet. As your pet heals after surgery, we are here for you every step of the way. Following surgery, pets recuperate on heated pads and blankets and receive dedicated care from one of our veterinary technicians. When your pet is discharged from the hospital, you will be provided with detailed information on how to properly care for your pet at home after surgery. We are also happy to answer any questions or concerns that may arise once you get your pet home. If you would like more information about the pet surgical services Pennington Animal Hospital offers for your pet or to schedule an appointment at our animal hospital in Huntsville, please call 256.883.4148.